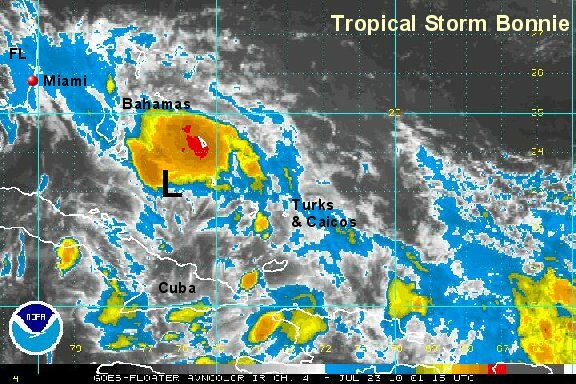 A strong tropical wave is near the northeastern Caribbean interacting with a strong upper low east of the Bahamas. Showers and storms are more concentrated, but no surface low is apparent at this time. Surface pressures are not particularly low either. Dispite this, forecast models continue to develop this low somewhat and take it either just north or near the northern Antilles over the next several days. Forecast models range from taking the low into eastern Florida to Mexico. Without a developed surface low the forecast models are guessing at an initial position....this is many times not very accurate. All interests in the Bahamas / Turks and Caicos / northern Antilles should monitor this disturbance. The tropical disturbance northeast of the Dominican Republic is getting better organized and is on its way to becoming tropical depression 3. The hint of a surface low is now seen in the visible satellite imagery about 50-100 miles north of the northeastern tip of the Dominican Republic. Winds aloft should become more favorable for development in the next few days. The high mountains of Hispaniola may inhibit development over the next 24 hours. 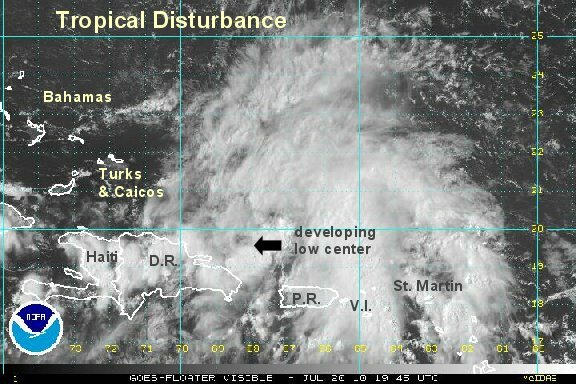 If the low stays north of the northern Antilles conditions appear favorable for development. Rainfall continues to be heavy with storms from the Leewards westward to Haiti. 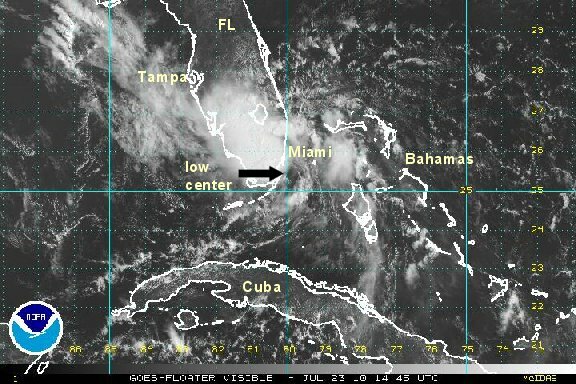 Today forecast models take this tropical low north of the Islands then near south Florida in a few days. The track spread now generally is from the southeast coast of Florida to the coast of the northern Antilles. All interests in south Florida / The Bahamas / Turks and Caicos / northern Antilles should monitor this disturbance. Satellite imagery shows some weak evidence that a low is still trying to from about 100 miles north of the coast of the Dominican Republic. This is where Quickscat sure would have been handy! The upper air trough is oriented almost north-south east of the Bahamas to Haiti. 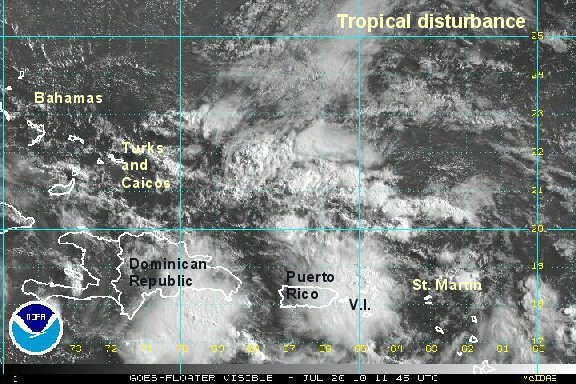 It is now far enough away to have lesser shearing effects on the tropical disturbance. In fact, excellent outflow aloft is now noted on the eastern side across the northeastern Caribbean. 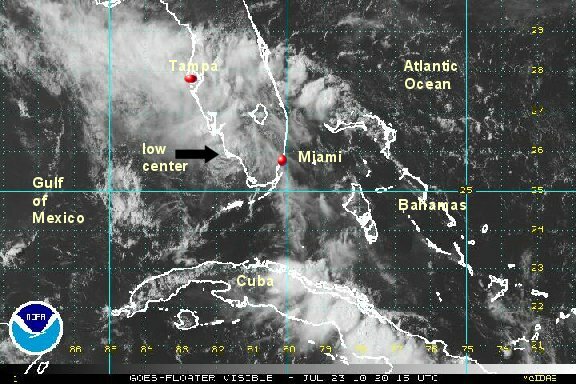 Today forecast models take this tropical low north of the Islands then near south Florida by Friday morning. The track spread is still generally from the southeast coast of Florida to the coast of the northern Antilles. 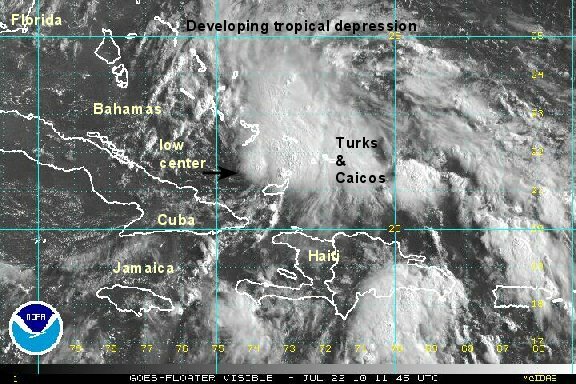 Visible satellite imagery shows a low level spin southeast of the Turks and Caicos. An upper air trough over the Bahamas continues to bring shearing winds keeping convection to the east side of the weak circulation. Low level inflow also has been hampered by the high mountians of Hispaniola to the southeast. Today's model runs keep the system weak as it moves to a position near extreme south Florida by Friday morning. The models generally curve the low toward the northcentral Gulf a few days later as a minor tropical system. Keep in mind that the models may not have a good representation of this low since it has not formed yet. 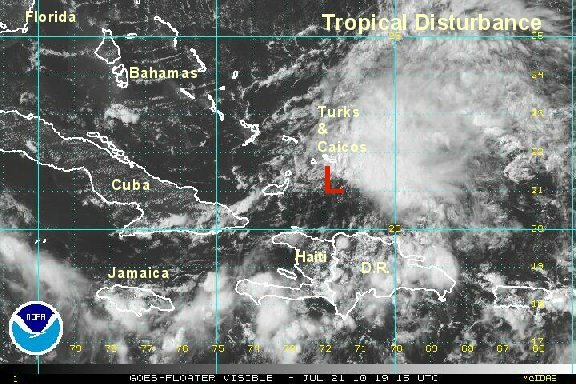 The upper low is still to the west of the tropical disturbance. It is close enough to inhibit development. Diffluent wind flow to the east is helping build showers and storms over the eastern Caribbean. A complete update will follow on Thursday morning. 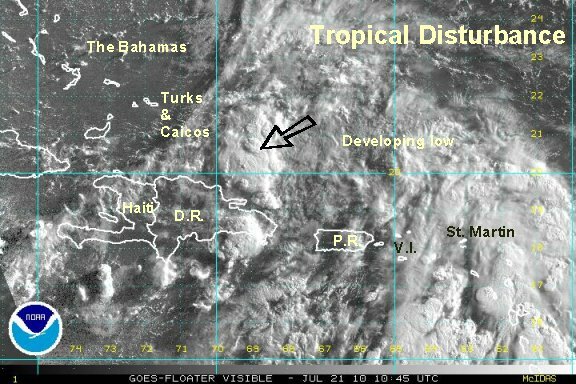 The tropical disturbance has just started to show signs of a closed low with the last visible satellite image. Strong diffluent winds east of the disturbance are bringing heavy showers and storms across the southeastern Bahamas and Turks and Caicos. A hurricane hunter recon will investigate later today. 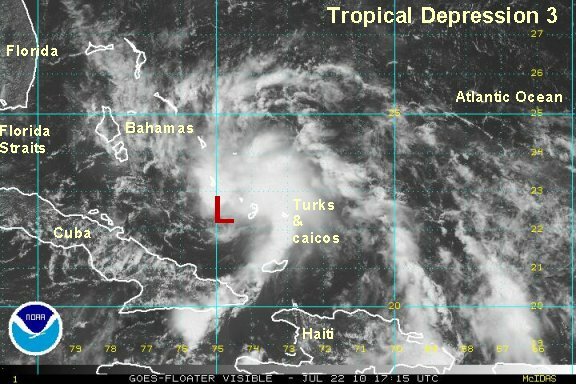 It is likely that low 97L will be classified as the next tropical depression. It appears that the "spaghetti plots" from a few days ago did not do a good job. When a low pressure center has not closed off the models are guessing more than normal. The latest forecasts have shifted the track south into the Florida Straits then take the low generally northwest toward Louisiana or the upper coast of Texas. It wouldn't be surprising to see the final low track much farther south if the current trend continues. Satellite imagery shows a developing low north of the coast of Cuba instead of farther north into the Bahamas such as the plots were forecasting yesterday. At 2 pm edt the tropical depression was centered near 22.3 N / 74.9 W or about 400 miles ese of Key Largo, Florida. Movement is wnw at 15 mph. Top sustained winds are 30 mph (35 mph NHC). Pressure 1008 mb. A hurricane hunter recon is currently investigating the low pressure center. An upper air trough remains west of the center of the low creating wind shear. This wind shear continues to hamper development. Scattered heavy showers and storms are east of the center near the southeastern Bahamas and Turks and Caicos. Forecast models continue to take a minimal tropical cyclone through the Florida Straits then into the Gulf toward either the coast of Louisiana or upper Texas coast. Development of tropical depression 3 will depend on how adversely the upper air trough continues to affect the system. 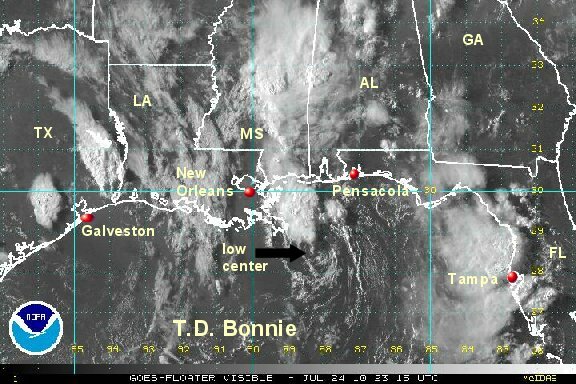 At 8 pm edt tropical storm Bonnie was centered near 23.1 N / 75.9 W or about 385 miles ese of Key West, Florida. Movement is wnw at 14 mph. Top sustained winds are 40 mph (40 mph NHC). Pressure 1007 mb. A hurricane hunter recon has confirmed that winds have strengthened to tropical storm force as surface pressure has started to drop. Forecast models continue to take a minimal tropical cyclone through the Florida Straits or across extreme south Florida then into the Gulf toward either the coast of Louisiana or upper Texas coast. Development of tropical stormm Bonnie will depend on how adversely the upper air trough continues to affect the system. 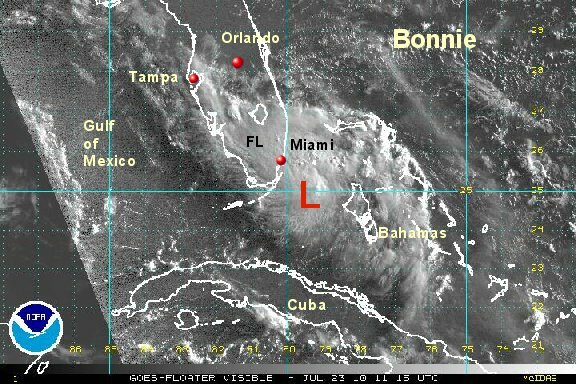 All interests in south Florida / The Bahamas / Cuba should monitor tropical storm Bonnie. Tropical storm Bonnie has not changed much since the last advisory. The satellite appearance of Bonnie shows a burst of deep convection in the central Bahamas north of the low. The low center itself will be moving near the southern tip of Andros Island in the southwestern Bahamas overnight. Keep in mind that it is not as important to the exact track of a weak tropical storm in respect to the worst effects of wind and rain. Many times the stronger winds and heavier rain is a fair distance from the low center. At 10 pm edt tropical storm Bonnie was centered near 23.2 N / 76.2 W or about 365 miles ese of Key West, Florida or about 295 miles southeast of Miami, Florida. Movement is wnw at 14 mph. Top sustained winds are 40 mph (40 mph NHC). Pressure 1007 mb. Forecast models continue to take a minimal tropical cyclone through the Florida Straits or across extreme south Florida then into the Gulf toward either the coast of Louisiana or upper Texas coast. Development of tropical storm Bonnie will depend on how adversely the upper air trough continues to affect the system. 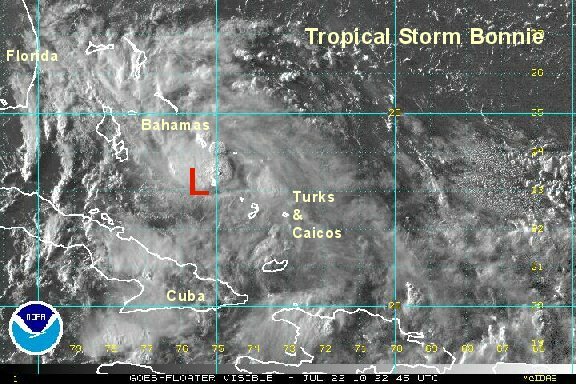 All interests in south Florida / The western Bahamas / western Cuba should monitor tropical storm Bonnie. Tropical storm Bonnie is struggling. The combination of a strong upper low over the central Gulf of Mexico and high in the Atlantic ocean is creating southeastly wind shear. It is possible that Bonnie will be sheared apart. In fact, Bonnie may not even be a storm now. Satellite imagery show a poor representation of Bonnie and we believe that Bonnie is actually just below tropical storm strength. Some squalls may surpass tropical storm strength as Bonnie makes landfall near Key Largo by around noon today. 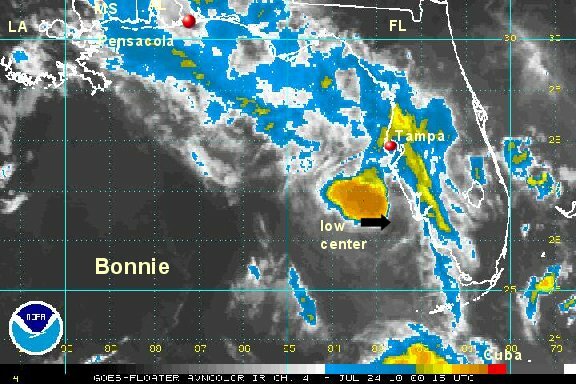 At 8 am edt tropical storm Bonnie was centered near 24.7 N / 79.8 W or about 80 miles sse of Miami, Florida. Movement is wnw at 19 mph. Top sustained winds are 35 mph (40 mph NHC). Pressure 1008 mb. Forecast models have shifted eastward by about 50-75 miles with most of the tracks taking Bonnie to southeastern Louisiana by Sunday morning. All interests in south Florida and northern Gulf coast should monitor tropical storm Bonnie. Do not panic if you live along the northern Gulf coast. Many of the forecast models do not strengthen Bonnie significantly as it approaches the northern Gulf of Mexico coast by Sunday morning. Stay vigilant. "Tropical Storm" Bonnie is now near Key Largo, Florida. One lone cluster of thundershowers is associated with the low center. The low is being exposed by shearing winds and it is our opinion that this is no longer a tropical storm. A tropical storm has sustained winds of 39 mph and winds are considerably lower than that. Miami and Fort Lauderdale have reported gusts to 25 mph. Homestead reported a wind gust to 32 mph. Sustained winds are in the range of 25-30 mph at this time. At 11 am edt tropical storm Bonnie was centered near 25.4 N / 80.3 W or near Key Largo, Florida. Movement is wnw at 19 mph. Top sustained winds are 30 mph (40 mph NHC). Pressure 1008 mb. Bonnie has finally been downgraded offically by NHC. In actuality, it has not been a tropical storm since the western Bahamas. The center of tropical depression Bonnie has moved into the Gulf of Mexico near Naples, Florida after crossing the southern Everglades today. 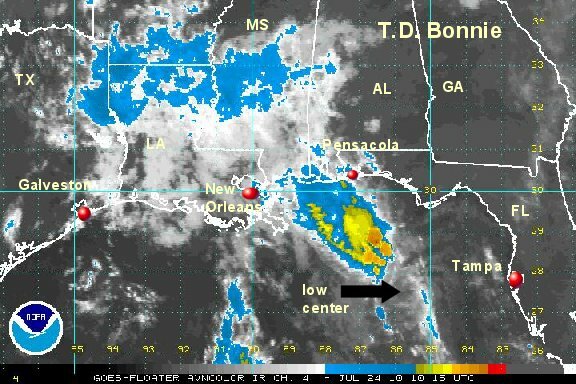 Heavy rain with Bonnie is in the eastern Gulf of Mexico displaced well northwest of the center of circulation. At 5 pm edt tropical depression Bonnie was centered near 26.2 N / 81.9 W or 35 miles south of Ft. Myers, Florida / near Naples, Florida. Movement is wnw at 18 mph. Top sustained winds are 30 mph (35 mph NHC). Pressure 1009 mb. It is possible that Bonnie will regain strength as a minimal tropical storm before landfall on the northcentral Gulf coast Saturday night. The models do not restrengthen Bonnie to a tropical storm before landfall. They have had a good track record recently and with the shear their is no reason to go against this. The heaviest rain will be well ahead of a landfall. All interests on the northern Gulf coast should monitor Bonnie. Do not panic if you live along the northern Gulf coast. Many of the forecast models do not strengthen Bonnie significantly as it approaches the northern Gulf of Mexico coast by Sunday morning. Stay vigilant. Tropical depression Bonnie continues to quickly move wnw. Only a small area of convection remains on the northwest side of the circulation. Southeastly wind shear remains strong limiting development. At 9 pm edt tropical depression Bonnie was centered near 26.5 N / 82.7 W or 420 miles east southeast of the mouth of the Mississippi river. Movement is wnw at 17 mph. Top sustained winds are 30 mph (35 mph NHC). Pressure 1009 mb. All interests on the northern Gulf coast should monitor Bonnie. The overall appearance of Bonnie changed little last night. There was a burst of deep convection for a short while, but upper air winds sheared the convection away. A small area of showers and storms remain on the northwest side of the center of circulation. Wind shear is expected to keep Bonnie from strengthening. Recent recon and buoy data confirms that Bonnie is weak with winds not much higher than 30 mph have been found. Seas were only in the 1-4 foot range. It looks like they can send the personnel back out to the oil spill ships already! There will be a lot of reporters at the coast dancing to come up with a topic to talk about. Good news for the oil spill clean up and us. At 7 am edt tropical depression Bonnie was centered near 27.7 N / 85.8 W or 215 miles southeast of the mouth of the Mississippi river. Movement is wnw at 17 mph. Top sustained winds are 30 mph (35 mph NHC). Pressure 1013 mb. Bonnie will make landfall tonight on the northcentral Gulf of Mexico coast. Bonnie has continued to weaken as it moved across the Gulf of Mexico today. When Bonnie makes landfall overnight night, there will be no appreciable effects except for a wind shift. Winds and seas remain weak. Bonnie was only a minimal tropical storm during its lifetime through parts of the Bahamas and possibly just as it made landfall on the southeast coast of Florida. At 8 pm edt tropical depression Bonnie was centered near 28.5 N / 87.6 W or 100 miles southeast of the mouth of the Mississippi river. Movement is wnw at 14 mph. Top sustained winds are 25 mph (30 mph NHC). Pressure 1011 mb.